Part #3901-A Zenith/Bearhawk Stainless Exhausts, now on shelf. Out of the many different models we offer, our best selling exhaust system is #3901-A, the model that fits all Zenith 601/650/750 aircraft, and also coincidentally fits the Bearhawk LSA. Because of it’s quality and popularity, it has usually on backorder for all 13 years we have offered it. The average delivery time has run something like 90 days. However, as another sign of the progress of 2016, we have made a very large batch of #3901-A’s, enough to cover all the existing orders and put about 10 more sets on the shelf. Above, a picture of a bin with 8 sets of exhausts in it waiting final inspection. The picture was taken in the SPA/Panther shop. 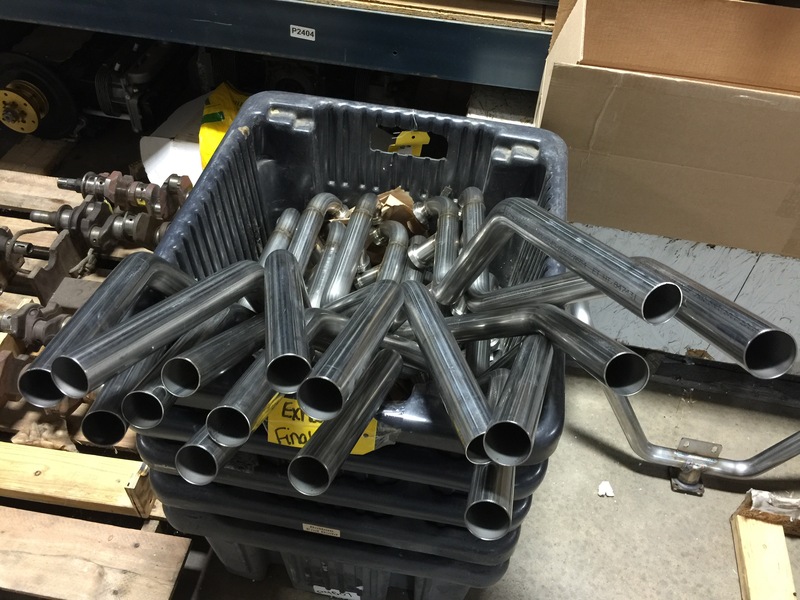 Over the years I have personally welded several hundred stainless steel exhaust systems for Corvair powered planes. Welding stainless is a skill that most welders never develop to a standard required by aircraft exhaust systems. They rarely understand the requirement for continuous internal purging of the weld, nor do most “local experts” understand the benefits of low hydrogen filler rods and pulsed welding. Fortunately for me, when my plate is full, I can have Travis, the head of welding at SPA/Panther weld many of the parts in our catalog. He is professionally trained by one of the nation’s oldest welding schools, he now has a number of years of experience, his uncorrected vision is perfect, and his concentration and focus are phenomenal. This most current batch of 3901-A’s are Travis’s craftsmanship. I inspected them closely, and I have to admit that the workmanship is as good as mine ever was. If you would like to learn more about #3901-A exhausts, follow this link: http://shop.flycorvair.com/product/3901-a-zenith-exhaust/. If you know that you will need one of these systems for your aircraft, and you would like to avoid any type of future delay, you may consider ordering one soon.